Picture a turtle the size of a Smart car, with a shell large enough to double as a kiddie pool. Paleontologists from North Carolina State University have found just such a specimen  the fossilized remains of a 60-million-year-old South American giant that lived in what is now Colombia. The turtle in question is Carbonemys cofrinii, which means "coal turtle," and is part of a group of side-necked turtles known as pelomedusoides. The fossil was named Carbonemys because it was discovered in 2005 in a coal mine that was part of northern Colombia's Cerrejon formation. The specimen's skull measures 24 centimeters, roughly the size of a regulation NFL football. The shell which was recovered nearby - and is believed to belong to the same species - measures 172 centimeters, or about 5 feet 7 inches, long. That's the same height as Edwin Cadena, the NC State doctoral student who discovered the fossil. "We had recovered smaller turtle specimens from the site. But after spending about four days working on uncovering the shell, I realized that this particular turtle was the biggest anyone had found in this area for this time period  and it gave us the first evidence of giantism in freshwater turtles," Cadena says. Smaller relatives of Carbonemys existed alongside dinosaurs. But the giant version appeared five million years after the dinosaurs vanished, during a period when giant varieties of many different reptiles  including Titanoboa cerrejonensis, the largest snake ever discovered  lived in this part of South America. Researchers believe that a combination of changes in the ecosystem, including fewer predators, a larger habitat area, plentiful food supply and climate changes, worked together to allow these giant species to survive. Carbonemys' habitat would have resembled a much warmer modern-day Orinoco or Amazon River delta. In addition to the turtle's huge size, the fossil also shows that this particular turtle had massive, powerful jaws that would have enabled the omnivore to eat anything nearby  from mollusks to smaller turtles or even crocodiles. Thus far, only one specimen of this size has been recovered. 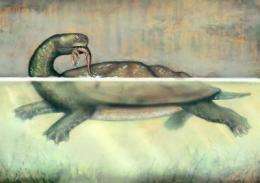 Dr. Dan Ksepka, NC State paleontologist and research associate at the North Carolina Museum of Natural Sciences, believes that this is because a turtle of this size would need a large territory in order to obtain enough food to survive. "It's like having one big snapping turtle living in the middle of a lake," says Ksepka, co-author of the paper describing the find. "That turtle survives because it has eaten all of the major competitors for resources. We found many bite-marked shells at this site that show crocodilians preyed on side-necked turtles. None would have bothered an adult Carbonemys, though  in fact smaller crocs would have been easy prey for this behemoth." The paleontologists' findings appear in the Journal of Systematic Palaeontology. Dr. Carlos Jaramillo from the Smithsonian Tropical Research Institute in Panama and Dr. Jonathan Bloch from the Florida Museum of Natural History contributed to the work. The research was funded by grants from the Smithsonian Institute and the National Science Foundation. More information: "New pelomedusoid turtles from the late Palaeocene Cerrejon Formation of Colombia and their implications for phylogeny and body size evolution". Authors: Edwin Cadena, Dan Ksepka, North Carolina State University; Carlos Jaramillo, Smithsonian Tropical Research Institute, Panama; Jonathan Bloch, Florida Museum of Natural History. Published: In the Journal of Systematic Palaeontology. Pelomedusoides comprises ﬁve moderate-sized extant genera with an entirely southern hemisphere distribution, but the fossil record of these turtles reveals a great diversity of extinct taxa, documents several instances of gigantism, and indicates a complex palaeobiogeographical history for the clade. Here, we report new pelomedusoid turtle fossils from the late Palaeocene Cerrejon Formation of Colombia. The most complete of these is represented by a large skull (condylobasal length = 16 cm) and is described as Carbonemys cofrinii gen. et sp. nov. (Podocnemididae). Carbonemys is incorporated into a parsimony analysis utilizing a modiﬁed morphological character matrix designed to test relationships within Panpelomedusoides, with the addition of molecular data from seven genes (12S RNA, cytochrome b, ND4, NT3, R35, RAG-1 and RAG-2) drawn from previous studies of extant Podocnemididae. C. cofrinii is recovered within Podocnemididae in the results of both morphology-only and combined morphological and molecular (total evidence) analyses. However, molecular data strongly impact the inferred relationships of C. cofrinii and several other fossil taxa by altering the relative positions of the extant taxa Peltocephalus and Erymnochelys. This resulted in C. cofrinii being recovered within the crown clade Podocnemididae in the morphology-only analysis, but outside of Podocnemididae in the combined analysis. Two panpodocnemidid turtle taxa of uncertain afﬁnities are represented by new diagnostic shell material from the Cerrejon Formation, though we refrain from naming them pending discovery of associated cranial material. One of these shells potentially belongs to C. cofrinii and represents the second largest pleurodiran turtle yet discovered. Analysis of pelomedusoid body size evolution suggests that climatic variation is not the primary driver of major body size changes. Cerrejon turtles also demonstrate that at least two major subclades of Podocnemididae were already in place in the neotropics by the Early Cenozoic. Because God threw a very human-like temper tantrum when his toy didn't do what he wanted it to... I used to smash matchbox cars with 10 pound dumbbell weights, same basic idea. Some creationist rated my comment with a 1, what ever happened to the golden rule? Or would you actually like me to rate your comments 1's? Creationist parody aside, it does seem utterly incomprehensible that so many fossil species should continue to be discovered and the story of the Ark not seem even sillier in the hands of its modern-day retellers.